Vex, The Best Selling Web App. Security Scanner in Japan. ※Fuji Chimera Research Institute, Inc.
High detection rate is achieved regardless of the website types based on the knowledge and skills cultivated from user’s feedbacks and the experience in our scanning service. 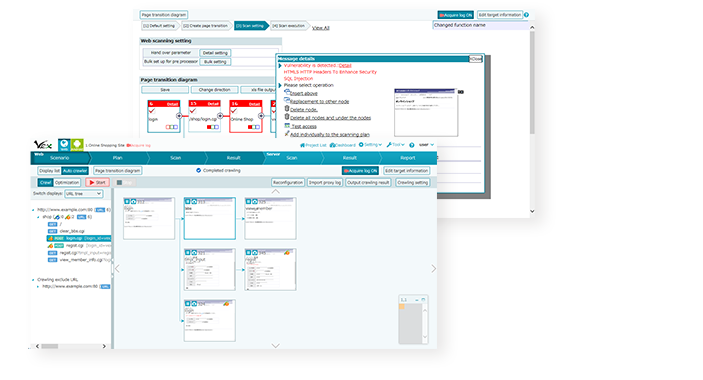 Multiple report templates for different purposes such as audit reports, executive summaries, and development process. 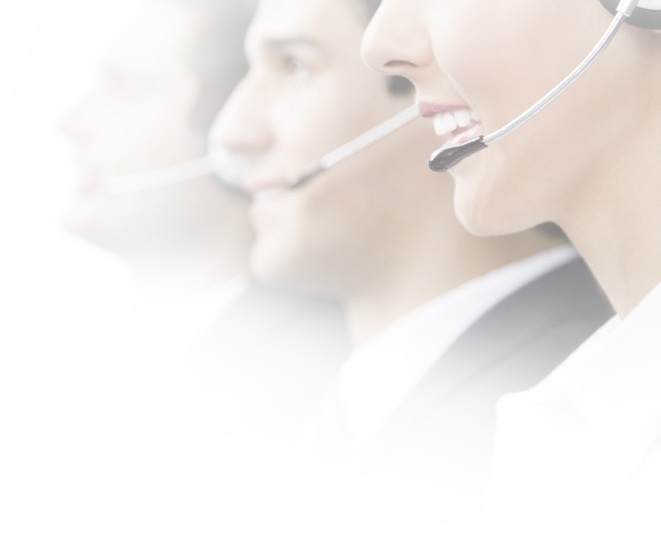 Comprehensive user support as to basic operation of Vex and further technical support for scanning all types of webapps. Support closely works with the development team to get user's feedbacks reflected to development of Vex. 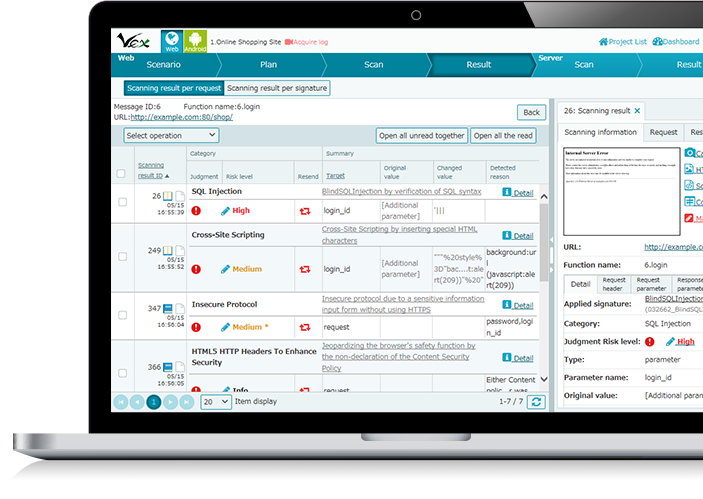 Vex has been developed by the engineers with rich understanding of vulnerability testing and the scenario creation methods for accurately detecting vulnerabilities. The technical know-how has been reflected and accumulated from our testing service. Vex is developed by engineer with knowledge of vulnerability tests, and also appropriate methods of creating scenarios to detect vulnerabilities correctly. The know-how is reflected from our testing service. High detection rate is achieved for any web-sites and scale. We release updates soon as critical vulnerability is reported. Many formats ready to suit any purpose. 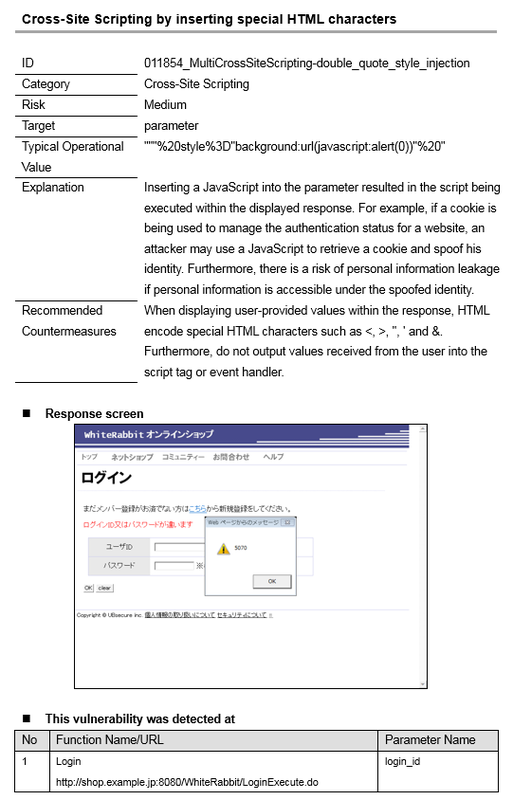 For example, checklists for developers, summarized report for web site owners, detailed report for security vendors. Regular update scheduled every three months. Improvement of existing feature, Addition of new feature, updates for scanning patterns. p. Irregular updates to work through critical vulnerabilities. Vex detected vulnerabilities that could not be done with previous methods and tools. Information sharing and integrated management of scan results data are also possible by running on the web server.